I have been wanting to make a version of Italian wedding soup for some time now and finally did it! Granted, I know a hot bowl of soup may not be the best summer meal, but the day I made this, it was quite a bit cooler. Anyway, even if you don’t make it now because the weather is too warm, it’s a good one to archive. For those of you lucky folks that have air conditioning, it won’t matter and you can make it anytime while keeping cool. The soup itself comes together quickly, but the most time consuming part (and it really doesn’t take that long) is making the meatballs. These can always be made ahead of time and stored in the refrigerator, which may be helpful if you have a busy schedule. Also, depending on the size of your meatballs, it will take more or less time to make them, unless you’re just an awesome meatball maker. In that case, take pride in the fact that you’re that good! 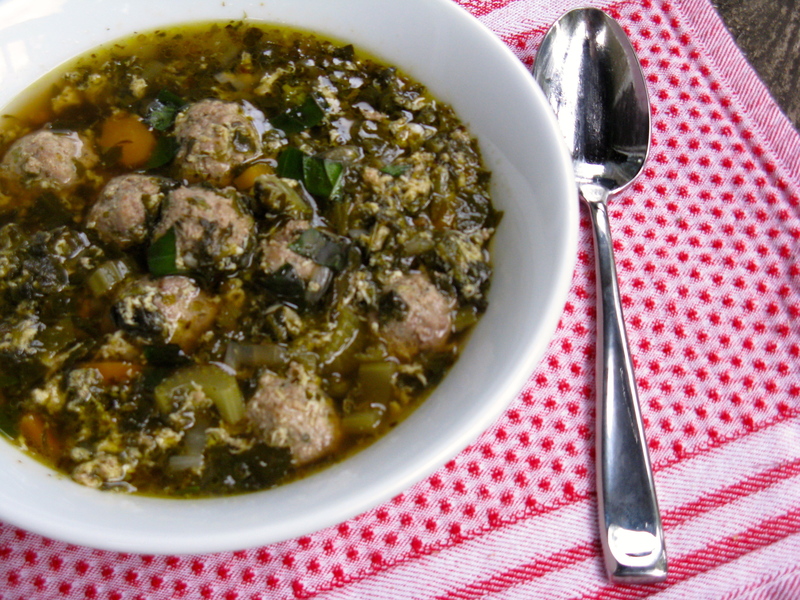 This recipe was inspired by and adapted from, Chow Bella: Paleo Italian Wedding Soup. Mix ingredients together in a large bowl with your hands. Form into small meatballs, about 1/2 tablespoon size and place on large plate. If desired, make meatballs larger or smaller. Once done, set aside or in the fridge until ready to use. Melt ghee in a large soup pot over medium heat. Add the carrots, celery, onion and garlic, and saute a few minutes, until softened a bit. Add the broth, oregano, parsley, sea salt and pepper. Stir and bring the soup to a gentle simmer. Then, add the spinach. Next, drop in the meatballs and allow to cook through. You will see them float to the top as they cook. Depending on the size of the meatballs, it it will take 8-10 minutes for them to cook. Pour in the beaten eggs in a thin stream, stirring with a fork when it meets the soup. Stir in fresh basil and serve immediately. This is perfect! Wedding soup without the noodles. This recipe looks amazing!!! I love italian wedding soup! Thanks! The soup is wonderful and loaded with meatballs! The egg makes it extra special too. I never knew what this soup was called and they always had it in my university’s cafeteria and I was obsessed with it…thanks for the recipe!! Wow, your school served Italian wedding soup?! We sure didn’t have it at Michigan State, but I was vegan then anyway, so I guess I wouldn’t have paid attention to it! Hi! Your Italian wedding soup was nominated as one of the “Best Italian Wedding Soup Recipes on the Net”. To vote for it, please visit http://easyitalianrecipes.org/soup-recipes/best-italian-wedding-soup-recipes-on-the-net-vote-for-your-favorite/ (your recipe is positioned at #169).